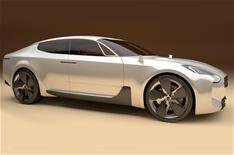 Kia GT concept car | What Car? Kia has revealed this GT concept car. Kia says that the design of the sporty rear-wheel-drive concept car has been inspired in part by the GT cars of the 1970s and the Kee concept car that Kia showed at the 2007 Frankfurt motor show. 'We wanted to create something similarly graceful, athletic and confident, but not aggressive or overbearing,' says Kia's European Design Chief, Gregory Guillaume. The athletic look is enhanced by a line of copper running from the bottom of each windscreen pillar, over the roof and down to the base of the rear windscreen. Copper is also used for eye-catching highlights to other parts of the GT, such as the brake callipers. Copper has also been used in the cabin design, inspiring the colour of the leather upholstery. There's also a glass instrument panel, with three layers of LED, while the starter button and twisting gear selector combine in one unit. The doors open at an upward angle, while the four single-piece seats 'float' on arched supports. Information from the car's early reveal last month suggested that a V8 engine would power the GT and that it could form the basis for a luxury saloon in the US. Kia has not yet confirmed this, however. Although a production version of the concept car is unlikely, Kia insiders recently told us that it intends to introduce a 'halo model' for the brand. The GT concept car show concept car is expected to be followed by a similarly sporty one using the same underpinnings - at the Detroit motor show in January 2012.